Alex Klein. Gordon Hunt. Peter Kolkay. Leonard Hindell. Ted Soluri. They are among the (classical music) rock stars of the oboe and the bassoon. And they’re coming to Lawrence. 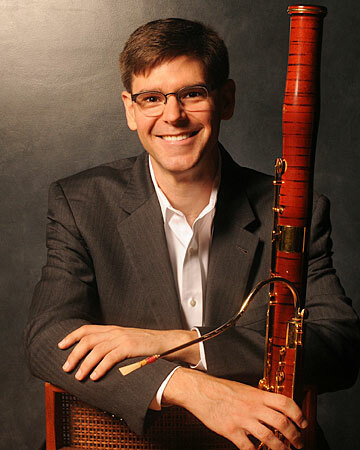 Award-winning bassoonist Peter Kolkay ’98 will be among the featured performers at one of the public concerts during the 2017 International Double Reed Society annual conference. Some of the world’s finest oboists and bassoonists will be among the more than 500 participants on campus June 20-24 attending the 2017 International Double Reed Society annual conference. Performers, many of whom are members of some of the world’s most prestigious symphony orchestras, music educators and students from 40 states and 15 countries, including Latvia, Kazakhstan and New Zealand, will be on campus for the conference that will feature exhibits, presentations, lectures, recitals and masterclasses devoted to the two instruments. The largest conference of any kind Lawrence has ever hosted, this is the first time the IDRS has held their annual program at Lawrence. Highlighting the conference will be four public evening concerts in the Lawrence Memorial Chapel — two orchestral performances and two chamber music performances — as well as a special “beer-themed” concert at Appleton’s Riverview Gardens. The IDRS Festival Orchestra, conducted by Mark Dupere, Lawrence’s director of orchestral studies, perform June 20 and June 24 while various conference musicians perform as a chamber orchestra June 21 and 23. All four concerts start at 7:30 p.m. in the Lawrence Memorial Chapel. A combination concert/beer-tasting will be held at Riverview Gardens, 1101 S. Oneida St., Appleton, beginning at 7 p.m.
No tickets are being sold for the Lawrence Memorial Chapel concerts, but a $10 donation is requested. Tickets for the Riverview Gardens performance/beer tasting are $25, available at the door. The ticket provides admittance and 4-ounce pours of genuine Wisconsin microbrews. Oboist Howard Niblock, professor of music at Lawrence and the conference’s co-organizer, said the international character of the conference should be of keen interest to area music lovers. “If someone comes to any of those evening concerts, they are going to hear performers from all over the world—England, Italy, Germany, France, Latin America,” said Niblock, who will retire after the 2017-18 academic year following a 37-year teaching career in the Lawrence conservatory. “This conference is bringing the world, and world class performers, to Appleton. These are musicians who would otherwise never be here. While the conference’s focus in on the oboe and bassoon, Carl Rath, who teaches bassoon in the Lawrence conservatory and has co-organized the conference, says the scope will extend beyond those two instruments. “There will be involvement with all instruments, including the didgeridoo and the tabla, and all styles of music from Baroque to contemporary styles, acoustic and electronic,” said Rath, a 1975 Lawrence graduate who organized an IDRS conference while teaching at the University of Oklahoma and has performed at 18 previous conferences. 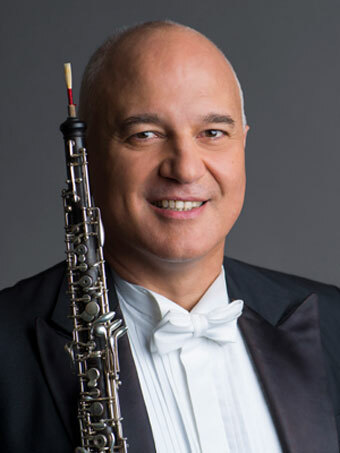 Klein, a native of Brazil who Niblock describes as “perhaps the world’s most famous oboist at this point in time,” is the former principal oboe with the Chicago Symphony Orchestra. During his career, Klein has won international oboe competitions in Geneva, New York, Tokyo and Prague. He will one of the performers in the Thursday (6/22) chamber orchestra concert. It will be a homecoming of sorts for Kolkay, a 1998 Lawrence graduate and current associate professor of bassoon at Vanderbilt University’s Blair School of Music. In 2002, he became the first solo bassoonist awarded First Prize at the Concert Artists Guild International Competition in the 51-year history of the competition. Two years later he became the first artist on his instrument to receive the prestigious Avery Fisher Career Grant. Kolkay, who performed on Lawrence’s 2006-07 Artist Series, is an artist of the Chamber Music Society of Lincoln Center. He will be one of the featured soloists in the conference’s final “gala” orchestra concert” Saturday (6/24). World-renowned oboist Alex Klein performs Friday, June 23 in a public chamber orchestra concert in the Lawrence Memorial Chapel. Photo: Todd Rosenberg Photography. Other high-profile performers include Gordon Hunt, widely considered the top oboist in England who plays with the Philharmonia Orchestra of London; Ted Soluri, the principal bassoonist of the Dallas Symphony and former principal of the Milwaukee Symphony Orchestra; and Leonard Hindell, second bassoonist with the New York Philharmonic and Metropolitan Opera Orchestra, who has performed under renowned conductors Leonard Bernstein and Zubin Mehta, among others. The three-set concert at Riverview Gardens will combine music with beer-tasting. Colorado’s Bill Douglas, a jazz-influenced composer, pianist and bassoonist opens the concert. A woodwind quintet follows with a set of pieces, with each movement named after a Wisconsin microbrewery. A rhythm section joins noted jazz bassoonist Michael Rabinowitz to close the show. While it was a bit of a coup for Niblock and Rath to get the IDRS conference to come to Lawrence — it was held in Tokyo in 2015, New York City in 2014 and will be in Spain next year — it’s a bittersweet victory for Niblock, who had to put his oboe on the shelf for five months while battling some health issues.